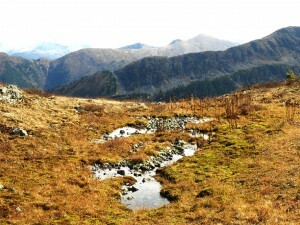 The originality of the vegetable cover of the Khakassky Reserve is defined by the complex of interconnected factors (geographical, climate, orographical, geological and edaphic), which have been forming the reserve’s contemporary flora and vegetation during the historical development process. At the present time to the summary of flora of steppe group of the reserve’s sections are included 837 higher vascular plant species, which are referred to 346 genuses and 84 families. It averages about 48% of the flora species composition of all the territory of the Republic of Khakassia (Ankipovich, 1999). 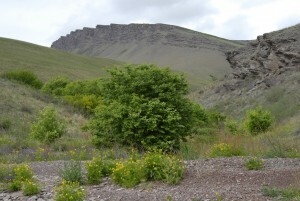 The riches of the flora species composition of steppe group of the reserve’s sections can be explained by the great variety of steppe zone econiches, geological antiquity of this territory, considerable flora transformation during the glacial epoch, and also by the disposition in the immediate vicinity of the Western Sayan and Kuznetsk Alatau mountain systems. The steppe vegetation of this section is represented by deserted, tree-grass, meadow, stony and solonetzic steppes. Nowadays the deserted steppes have limited area of distribution; they are usually situated in barren soils. The vegetation cover is sparse and squat. The soil covering with plants does not exceed 40%. The gramineous basis of phytocenosis is composed of Agropyron crislatum, Cleistogenes squarrosa, Festuca valesiaca, Elytrigia geniculatum. 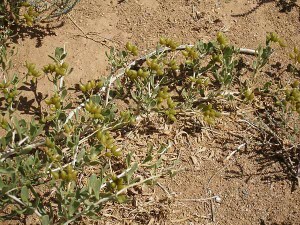 The common plants are Panzeria lanata, Thymus, Artemisia frigida, Ceratoides papposa, Kochia, Caragana pygmaea and so on. The bunch-grass true steppes are widespread. The basis of the vegetation cover is composed of gramineous plants, such as Festuca pseudovina, Koeleria cristata, Stipa krylovii, Poa botryoides, Cleistogenes squarrosa, which bloom in early June. The presence of other plants adds especial brilliance to the phytocenosis of bunch-grass gramineous steppes. The plants usually bloom either in spring or in the end of summer, when the steppe awakes after the summer resting period. Besides the gramineous plants, there are Veronica incana, Heteropappus altaicus, Artemisia frigida and Artemisia glauca, Thalictrum foetidum, Carex pediformis. Caragana pygmaea, Artemisia martjanovii and Cymbaria dahurica can also be found in such vegetation communities. 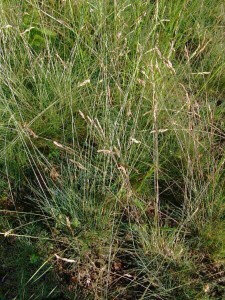 The grass canopy of bunch-grass steppes is sparse and short and does not exceed 10-15 cm of height. The major-grass true steppes occupy mainly the common soils rather than southern chernozems. The stipa steppes are spread wider, oat grass ones a little rarer. The grass canopy of the major-grass steppes is much more dense and high, than that one of bunch-grass steppes. There can be found Stipa capillata, Helictotrichon desertorum, Poa stepposa, Agropyron cristatum, Phleum phleoides, Carex supina, Dianthus versicolor, Galium verum, Medicago falcata and other plant species. The meadow steppes and steppificated upland meadows occupy only small areas and can be found on the northern slopes of knolls and ridges as small areas in the high-water beds of the rivers. As a rule, these territories are the most humidified ones with leached, rarely common chernozems, characterized by high level of productivity. The steppificated meadows, as well as meadow steppes, are typical for the vegetation of forest-steppe zone. The most widespread aggregations are grassland gramineous and grassland ones. The basic plant species of meadow steppes and steppificated meadows are Iris ruthenia, Phleum phleoides, Poa stepposa, Bromopsis inermis, Stipa pennata. Among forbs the following plant species are the most abundant: Bupleurum multinerve, Fragaria viridis, Sanguisorba officinalis, Astragalus danicus, Dracocephalum ruyschiana, Phlomis tuberosa, Scabiosa ochroleuca, Ligularia glauca and other beautifully blooming plants like Hemerocallis minor, Trollius asiaticus, Anemone sylvestris, Lilium pilosiusculum. On all the reserve’s territories the stony steppes are widespread. They are situated near the steep stony slopes of the southern expositions and represent different developmental stages of steppe aggregations, which depend on the degree of fine earth accumulation. 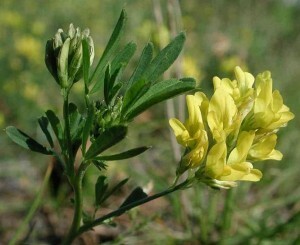 Except common widespread steppe plant species, there can be found typical species for this phytocenosis. First of all, these are the relict species like Patrinia rupestris, Kobresia filifolia, Gypsophila patrinii, Aster alpinus, Chamaerhodos erecta and other plant species like Orostachys spinosa, Arctogeron gramineum, Goniolimon speciosum, Androsace dasyphylla, Ephedra monosperma, Asparagus pallasii, Phlox sibirica. 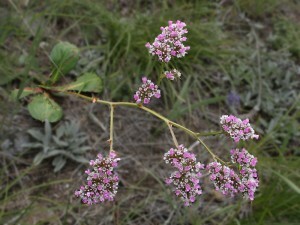 There are also weed plant species like Chenopodium aristatum and Chenopodium album, Amethystea caerulea, Salsola collina, and shrubs: Сaragana genus, Spiraea, Rosa acicularis. In saline soils the Achnatherum and hemp nettle steppes are widespread and generally occupy the territories around the mineralized lakes. The salt vegetation usually grows along the brine lakes waterside; there are such plant species as Suaeda, Salicornia europaea, Salsola, Limonium gmelinii, Saussurea salsa, Nitraria sibirica can be met. With moving off the lake the vegetation changes into different aggregations of saline meadows (usually with the thickets of Iris biglumis), after which the hemp nettle or Calamagrostis solonetzic steppes are situated. Frequently, the small stripes of Achnatherum solonetzic steppes can be found between the meadow and steppe vegetation. The Achnatherum steppes is composed of Achnatherum splendens. The floodplain and valley meadows are widely spread in such reserve’s sections as “Podzaploty”, “Lake Itkul”, “Lake Shira”, “Kamyzyaksky steppe with Lake Ulug-Kol”. There can be found mainly the solonetzic meadows, where the basic plant species composing the grass canopy are Poa pratensis, Festuca rubra, Beckmannia syzigachne, Hordeum brevisubulatum, Alopecurus pratensis. Such plant as Equisetum arvense, Potentilla anserina, Geranium pratense, Inula britannica and so on also grow there. The floodplain and valley meadows occupy quite small areas. The gramineous, bluegrass, sedge swamped meadows more widespread there. 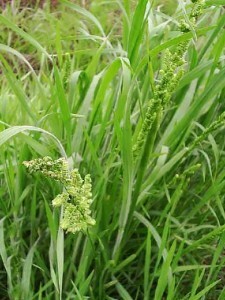 The grass and grass gramineous meadows can be found in dry areas. Such territories are rich in various plant species. To the forbs of these areas the following plant species are added: Rumex thyrsiflorus, Trifolium pratense and Amoria repens, Sanguisorba officinalis, Filipendula ulmaria, Veronica longifolia, Ligularia sibirica, Primula cortusoides, Trollius asiaticus, Hemerocallis minor. The steppe meadows are sometimes overgrown with Salix kochiana, Salix rosmarinifolia, Salix taraikensis, Betula pendula. The marshes can be found mainly in river valleys and lakesides. The common reed and clubroot marshes appear and develop in waterlogged territories with open water basins. Such plant species as Phragmites australis, Bolboschoenus maritimus, Bolboschoenus planiculmis, Scirpus tabernaemontani, Equisetum, Typha laxmannii, Alisma plantago-aquatica, Butomus umbellatus grow in these territories. The considerable areas are occupied by sedge low-lying marshes. 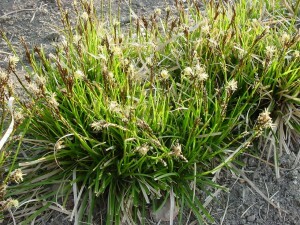 The basis of their grass canopy is composed by Carex caespitosa, Carex delicata, Carex songorica; Calamagrostis neglecta, Poa palustris, Caltha palustris. The tree and shrubbery vegetation can be found on the northern slopes of the reserve. It is represented by small woods and thickets. There are small woodlands in some of the reserve’s sections. The forest stand is composed of Betula pendula and Larix sibirica. Populus tremula can be found rarer. These plant species sometimes compose the pure stands, but more often – mixed ones. The typical communities are birch, birch-larch and larch-birch forests. The closing of leaf canopy is about 0,2-0,5, the productivity is no more than IV-V bonitet classes. There are not only the forests of parkland type with sparse underwood, but also the forests with well-developed underwood (the density of canopy is about 20-70%). Such plant species as Spiraea, Cotoneaster melanocarpus, Rosa acicularis, Caragana arborescens prevail among the forest underwood. To these plant species Rhododendron dauricum adds in the “Hol-Bogaz” section. It forms thickets even outside the forest canopy in the steppe areas. The larch light forest can be found on steep southern slopes. Some scattered larches and group of trees are spaced a long distance apart. The space between them is occupied by various steppe phytocenoses. The steppe brushwoods are widespread in these thickets. 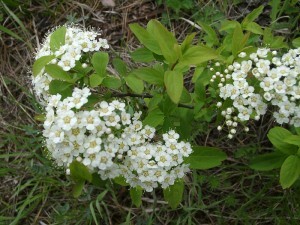 They are usually composed by Spiraea media, Cotoneaster melanocarpus, Caragana arborescens, Rosa acicularis; Padus avium, Crataegus sanguinea, Berberis sibirica, Lonicera altaica, Atraphaxis frutescens. 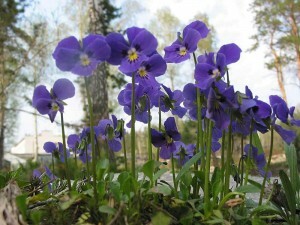 There have been registered 541 higher vascular plant species in the mountain taiga group of sections, which are referred to 71 families and 250 genuses. 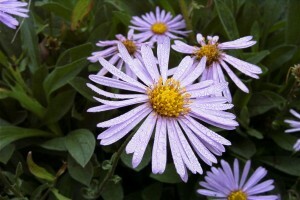 There are 26 higher cryptogamic, 8 gymnospermous and 507 angiosperms plant species among them. From among all registered higher vascular plants 21 are listed in the Red Book of the Russian Federation and the Republic of Khakasia. The group of endemics consists of 29 species, which are referred to 15 families and 20 genuses. Among them there are: 18 – the endemics of Altai-Sayan region; 2 – the endemics of Sayan Mountains; 1 – the endemic of Western Sayan Mountains territory; 7 – the endemics of Western Sayan and Altai areas; 2 – the endemics of Altai area and the western part of the Western Sayan Mountains. 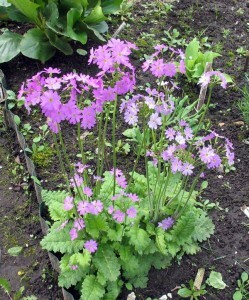 The flora is characterized by presence of a lot of relicts, such as Dryopteris filix-mas, Erythronium sibiricum, Anemonastrum sibiricum, and so on. In the character of vegetation cover the altitudinal zonality is well-observed, there are two zones: high-mountain and mountain taiga ones. 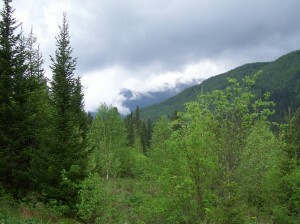 The vegetation is referred to forest, meadow and tundra types. With the increasing of an mountain elevation altitude and the intensification of climate aridization the bounds of vegetation zones move up. The Western Sayan Mountains represent a mountain system that has broad latitudinal strike characterized by sharp difference in macroslopes vegetation of southern and northern expositions. At the lower part of mountain taiga zone, at a height of 400-700 mthe birch and aspen secondary forests and mixed forests are situated, where can also be found conifers: pine, Siberian larch, fir and spruce. The gray and light-gray forest podzolic soils are formed under such forests. Above 600-700 m there is a mountain dark coniferous taiga consisting of fir (Abies sibirica), cedar (Pinus sibirica) and spruce (Picea obovata). Thick and wet Sayan forests are situated in the mountain forest soils. 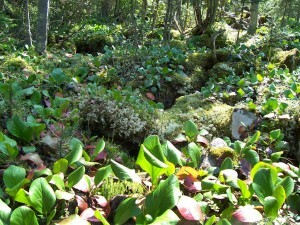 The cover of true mosses forms in fir forests. 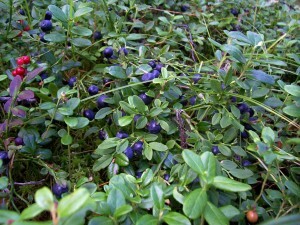 Such plant species as Vaccinium myrtillus, Vaccinium vitis-idaea, Mojanthenum bifolium, Trientalis europaea, Linnaea borealis grow there. The foliage trees (Betula pendula, Populus tremula, Padus avium) singly grow among the coniferous trees. The upper boundary of mountain taiga zone is situated at a height of 1550-1600 min the west and 1900-2100 in the east in theSayan mountains. There are a lot of cedars nearby these territories, and the larches grow together with the cedars in the east reaching the upper boundary of the forest cover. Lichens and true mosses can be found under the canopy of cedar forests. Along river valleys small areas of birch forests stretch, sometimes accompanied by fir and Siberian cedar. Birch is included into the second growth of cedar and fir forests. There can be found mixed forests where birch dominates with true mosses or, rarely, Calamagrostis obtusata covering.Aspencan also be found as an admixture to the mixed dark coniferous forests at the foots and the lower parts of southern slopes near the river valleys. In the high-water bed of rivers there are high-grass meadows and small areas of reforested or bushy swamps with Pentaphylloides fruticosa. Tundra occupies almost the whole territory of high-mountain zone; and meadows occupy the territories of cedar and fir subalpine sparse woods. Some areas of dwarf plant communities alternate with stony spreading. Along the boundary of mountain taiga forest on the slopes of southern expositions there can be found Pinus sibirica sparse woods with subalpine short-grass and brushwoods consisted of Salix glauca. There is a lot of Betula rotundifolia, different types of brushwoods and wonderfully blooming plants among the true mosses. 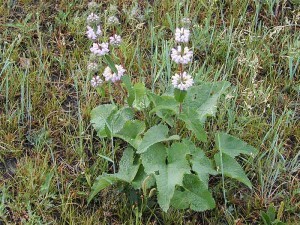 Rhaponticum (Rhaponticum carthamoides) or so-called “maral root” grows in the small forest meadows. It has rose inflorescences and jagged leaves reminding the antlers. 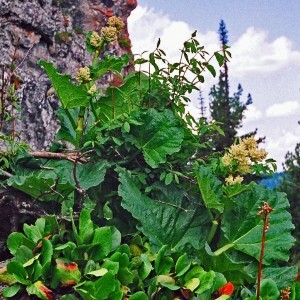 Thickets of the other valuable medicinal plant – stonecrop (Rhodiola rosea) – can be found a little higher, on the boundary of cedar sparse forest near the banks of mountain springs. Mountain tundra occupies very large areas of the territories with vertical zonality and extends on different height. 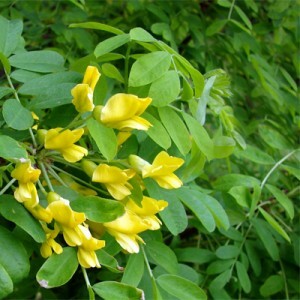 Brushwood tundra is situated usually in hollows, closed depressions and river valleys of the northern slopes. The soil surface is covered with almost solid moss canopy; the thickets of Salix glauca and Betula rotundifolia of about 20-40 cm height rise over it. A lot of high-mountain territories are occupied by stony and detritus tundras. The vegetation cover is usually not solid, it consists of lichen clump, Dryas oxyodonta, some types of alpine graminaceous plant species (like Hierochloe alpina, Poa alpina, Koeleria atroviolacea), Crepis chrysantha, which alternate with spots of bare stony or loamy soil. The stony eruptions, rocks, snowy fields and glaciers are situated upper than tundra vegetation. Subalpine and alpine meadows occupy small territories usually on well-warmed southern slopes or in the upper reaches of river valleys; they are characterized by poor floristic composition and abundance of arctic plant species. 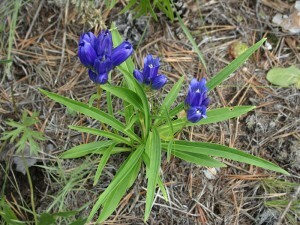 Subalpine meadows are represented by high-grass and short-grass meadows. Alpine meadows is the integral part of the reserve’s vegetation. They occupy the slopes of northern exposition where tall and small grass meadows can be marked out. There are meadows of different compositions; they occupy shallow flow hollows on slopes with various degrees of steepness and terraces. Aquilegia glandulosa prevail in the grass canopy of such meadows. The meadows are usually close to subalpine large grass along the riverbanks. Sometimes these meadows are so spacious that the slopes seem to become blue during the Aquilegia glandulosa blossoming. They are the most picturesque meadows of the high-mountains. At that time other colors of blooming plants are added to Aquilegia glandulosa: the orange spots of Trollius asiaticus, pink – of Oxytropis altaica, white – of Callianthemum sajanense and yellow – of Doronicum altaicum. 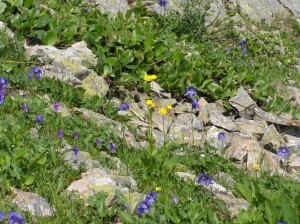 Besides the high-growing vegetation there is a lot of beautifully blooming low-growing plants such as Viola altaica, Sibbaldia procumbes, Ciminalis grandiflora. The soil surface is covered with moss.